The volume of out-migration from the three countries of the South Caucasus greatly increased after the collapse of the Soviet Union in 1991. Data from the 2009 Caucasus Barometer (CB) shows that this trend continues. 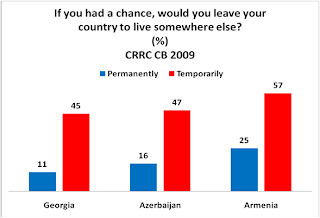 Fifty seven percent of Armenians want to temporarily leave Armenia, while this number is 45% in Georgia and 47% in Azerbaijan for their respective populations (See Figure 1). Twenty five percent of Armenians want to permanently leave Armenia, while this number is 11% and 16% for Georgia and Azerbaijan, respectively. According to data provided by the National Statistical Agencies of Armenia, Azerbaijan and Georgia, the 2009 migration balances in these countries were -25, +1 and +34 people (in thousands), respectively. Thus, the number of people who left Armenia exceeded the number of those who entered by 25,000. In contrast, the number of people who entered neighboring Georgia and Azerbaijan was higher than the number of people who left these countries. Why do so many Armenians leave Armenia? In all three countries, there is a general trend of younger people being more inclined to emigrate. Figure 2 shows that with respect to gender, there is a fairly even percentage of men and women who want to temporarily or permanently migrate abroad from Georgia. However, there is a higher percentage of men in both Armenia and Azerbaijan that want to temporarily or permanently migrate abroad when compared to women. Yet, we find that the percentage of those who wish to leave Armenia is higher than in the other two countries. Perhaps this is due to structural factors such as regime type, level of socioeconomic inequality (unemployment, per capita GDP, Gini index), risk or presence of war, level of corruption, or social/cognitive factors including the existence of friends and family abroad, or feelings of rejection, trust or emptiness. Table 1 shows a few possible explanatory factors. Armenia lies in between Georgia and Azerbaijan with regard to all of the structural factors: regime type, per capita GDP, unemployment rate and level of socioeconomic inequality. There is a discomfort regarding territorial disputes in all three countries (Nagorno Karabagh, Abkhazia and South Ossetia). However, the Armenian population stands out as having more friends and family abroad and as having more negative feelings. The CB shows that 56% of Armenians have a family member abroad, while this number is 40% and 37% in Azerbaijan and Georgia, respectively. These numbers are 36% in Armenia, 16% in Azerbaijan and 26% in Georgia with respect to having a close friend abroad. Moreover, more Armenian households rank money from relatives abroad as the first source of income (6%), than households in Georgia (4%) and in Azerbaijan (4%). Why do you think the level of out migration is so much larger for Armenia in comparison to Georgia and Azerbaijan? Share your thoughts and ideas with us.